1) A superior low-noise power supply. 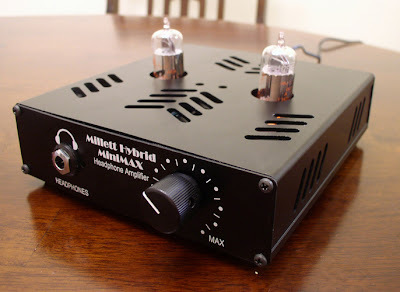 The standard configuration has been optimized for 0.045mVAC in the power supply, measured at V+ and Gnd, with the tubes burning and the buffers biased at 50ma each. 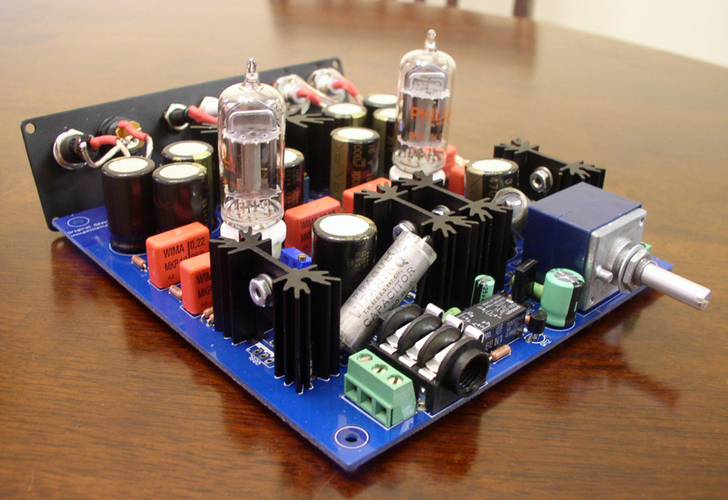 This is outstandingly low noise performance for a linear regulated power supply. Moreover, this is all imbedded in the PCB design - only requiring a 24VAC walwart for complete power. 2) A custom-machined case design from Lansing Enclosures. Based on their "DT1" case design, the MiniMAX is optimized for the smallest volume, width, and length practically possible with through-hole components and full-size extruded heat sinks. With the custom-machined case, commercial-grade finish quality is possible for every MiniMAX builder. Optionally, DIY-versions of the Lansing DT1 and CT1 case are easily constructed. 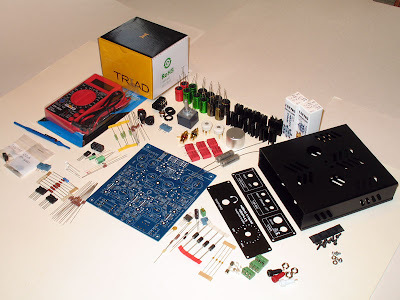 My experience ordering the kit from Tom was excellent, everything was well packed and labeled for ease of installation. 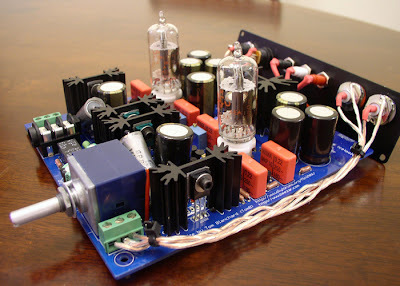 The documentation on this amp is above and beyond anything else I have seen. In the interest of adding a few personal touches, I swapped out the high output LEDs for diffused orange ones from Digikey (I'm not a big fan of bright LEDs), I also swapped four of the Nichicon caps in favor of the newer release Elna Cerafines from Partsconnexion. You'll also notice some Kimber TCSS wiring and Cardas RCAs. The knob is a milled-aluminum type from Digikey. For the price, the sound is very good. There is better out there, but for more money of course ;) A very recommendable first build. The Millett MiniMAX is an excellent starter kit. There were no Little Dots in the Center Point Meet, and the MP5 of Mochan was a little difficult to relocate. 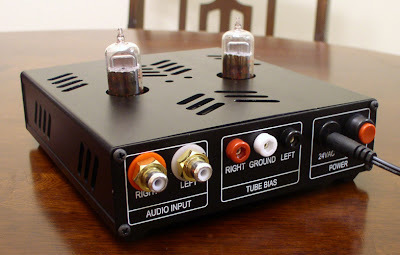 It's a very good question as they are both reasonably priced tube headphone amp kits that include everything necessary for the build. I would say though that the two are very different approaches. The MiniMAX is a hybrid design on PCB with external power supply, whereas the Crack is a simple classic tube design using point-to-point wiring and an internal power supply. I actually didn't spend too much time with the Crack without the Speedball upgrade, but I don't remember the original circuit being particularly engaging to these ears. With the speedball, the sound is improved quite a bit, the bass was tighter, detail is better and the overall sound more refined. The MiniMAX is very neutral and very good sounding for the price, but I found the Crack w/Speedball to be more enjoyable to listen to. There's a bit more treble energy and more palpable midrange with the right tubes. I'd also recommend checking out the Torpedo @ Beezar. I have yet to compare the Crack and Torpedo directly; but the performance is very impressive for the price.